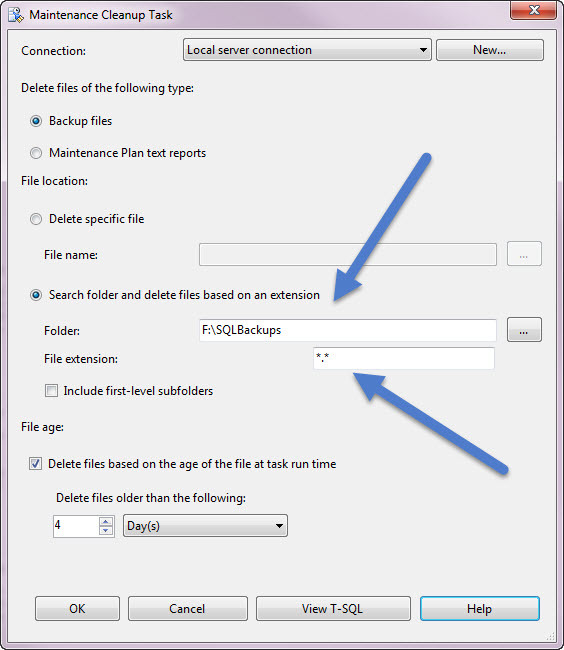 MS SQL Server MAINTENANCE CLEANUP TASK job failure and how to fix it! If you get this maintenance plan error for MAINTENANCE CLEANUP TASK within your error logs and your maintenance jobs are under Microsoft SQL Server (MSSQL) I have an easy fix for you. Executing the query “EXECUTE master.dbo.xp_delete_file 0,N”,N”,N’2014…” failed with the following error: “Error executing extended stored procedure: Invalid Parameter”. Possible failure reasons: Problems with the query, “ResultSet” property not set correctly, parameters not set correctly, or connection not established correctly. Make sure the following fields are completed (file path) and that you are using *. * in the extension.